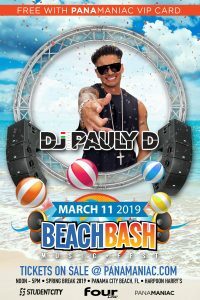 Reality TV icon and live music sensation, DJ Pauly D, has officially confirmed that he will perform live during Spring Break 2019 in Panama City Beach. Get ready for a massive live performance during the Beach Bash Music Fest on March 4 and 11 at Harpoon Harry’s. This event is FREE with your 2019 Panamaniac VIP Card – now on sale at a 20 percent discounted rate! 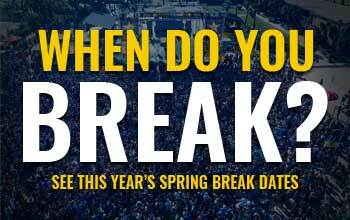 The Beach Bash Music Fest is Spring Break’s hottest event that you won’t want to miss out on. Individual tickets are also on sale at a special early-bird rate at www.beachbashmusicfest.com. Don’t wait, get your VIP Cards or tickets now! This event will sell out. Panamaniac VIP Cards are currently 20 percent off, but not for long. On October 12, prices go up. Get your card now and save money! BUY YOUR VIP CARDS NOW AT AN EARLY-BIRD 20% DISCOUNT BY CLICKING HERE..